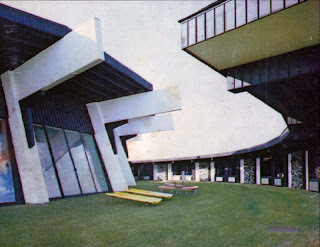 Someone on Tiki Central posted a link to an astounding combination of late 60s architecture and 70s taste... The Gobbler in Wisconsin. 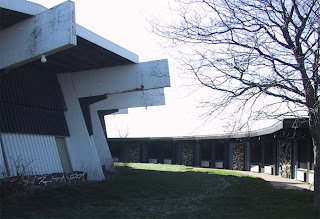 ﻿Lileks has created what amounts to a virtual tour of what he has dubbed, "the grooviest motel in Wisconsin". 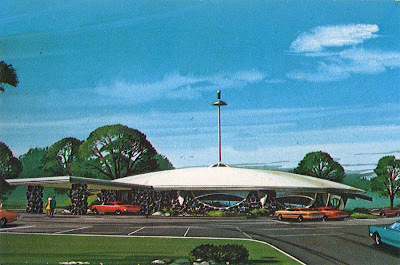 It documents the motel-bar-restaurant with a mix of original brochure illustrations and photographs as well as more recent photographs of its eventual decay. ...and a healthy reminder that not everything in the past was good. It isn't. It's dead and gone. Plush'n'plastic - my idea of seck-seee! First, have to say the couple in the first pic with outfits that match their 'vette? They are not there to attend a church retreat - desk clerk, check for wedding rings! Yes, Dana, my mom and I lived in a house with brown shag carpet, orange Brady Bunch counters and a giant round fireplace with a suspended chimney and everything thought we were COOL! 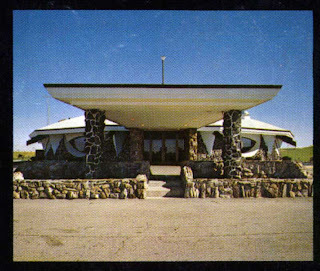 I kind of love the Gobbler :) There was something in Atomic Ranch about this place that got my interest but I forgot to look it up, so thanks for sharing the link! I love it!!! I would so take a road trip to Wisconsin if it was still open. re artwork: I should clarify - I meant that the stone/rock exterior that I love so much in the illustrations didn't look so great in reality. However, on closer inspection, the rocks near the steps look a bit different and may have been added at a later date.